Cardinal Harbour Homes for Sale | Prospect, Kentucky | Cardinal Harbour Real Estate | Louisville MLS | Joe Hayden Realtor - Your Real Estate Expert! View all Cardinal Harbour Homes for Sale on the Louisville MLS listings below! Cardinal Harbour real estate is located off of Rose Island Road near Prospect, Kentucky in Oldham County. The subdivision of Cardinal Harbour is approximately 40 years old, with many of the homes between 20 and 30 years old. 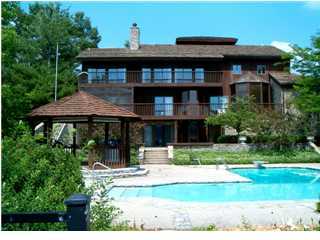 Cardinal Harbour is located next to the Ohio River giving most of the homes spectacular river views. Homes in Cardinal Harbour are mostly custom-built, many of the homes feature unique floor plans, and the neighborhood itself features large open spaces to emphasize the river views. Homes for sale in Cardinal Harbour are typically priced from $150,000 to over $750,000. Cardinal Harbour does have a variety of home styles and you can also find townhomes in Cardinal Harbour. Many of the homes in Cardinal Harbour are constructed of wood siding, though you can also find brick homes and ones with vinyl siding. In addition, some of the homes will feature finished basements, though being so close to the Ohio River means that you must be cautious about water intrusion into your basement in Cardinal Harbour. Cardinal Harbour is in Oldham County which means that you have access to the award-winning Oldham County School System. In addition, the subdivision of Cardinal Harbour features over 50 acres of land maintained by the HOA, boat docks, tennis courts, a community pool, walking trails, river access, and a club house all for use by the residents. Cardinal Harbour is also convenient to the shopping available in downtown Prospect, in addition to other local subdivisions such as Hillcrest. You can research all Homes for Sale in Cardinal Harbour in the Louisville MLS listings below. Discover homes in Cardinal Harbour by searching the MLS for your perfect home. Cardinal Harbour is a great place to call home!